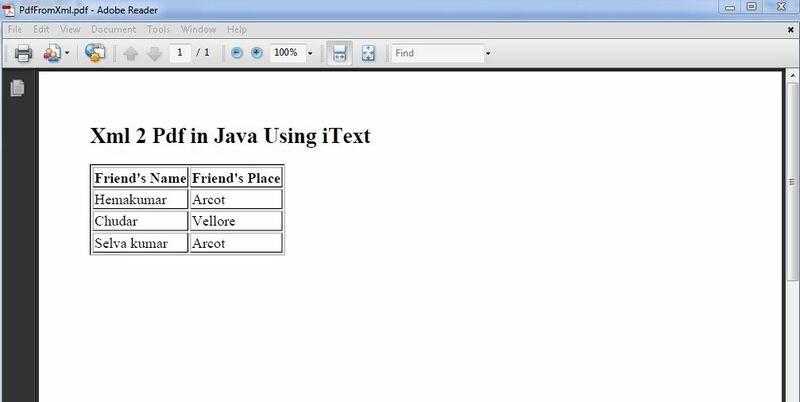 We can convert any xml file to pdf in java using iText lib. // Specifying the location of the outpuf pdf file. in the HTML: I have the color.. Warning: org.apache.xerces.jaxp.SAXParserImpl$JAXPSAXParser: Property ‘http://www.oracle.com/xml/jaxp/properties/entityExpansionLimit’ is not recognized. Warning: org.apache.xerces.parsers.SAXParser: Feature ‘http://javax.xml.XMLConstants/feature/secure-processing’ is not recognized. Warning: org.apache.xerces.parsers.SAXParser: Property ‘http://javax.xml.XMLConstants/property/accessExternalDTD’ is not recognized. Warning: org.apache.xerces.parsers.SAXParser: Property ‘http://www.oracle.com/xml/jaxp/properties/entityExpansionLimit’ is not recognized. IS it possible to use iText if i have a XML-file that i want to pictures if some text-element is a specific value? or do i do this in XsL? Hi, can you post the full source code to help you better…..
it look strange when I try this.. Warning: org.apache.xerces.jaxp.SAXParserImpl$JAXPSAXParser: Property 'http://www.oracle.com/xml/jaxp/properties/entityExpansionLimit&#039; is not recognized. Warning: org.apache.xerces.parsers.SAXParser: Property 'http://javax.xml.XMLConstants/property/accessExternalDTD&#039; is not recognized. Warning: org.apache.xerces.parsers.SAXParser: Property 'http://www.oracle.com/xml/jaxp/properties/entityExpansionLimit&#039; is not recognized. org.xhtmlrenderer.util.XRRuntimeException: Can't load the XML resource (using TRaX transformer). org.xml.sax.SAXParseException; lineNumber: 18; columnNumber: 3; The element type "img" must be terminated by the matching end-tag "</img>". Caused by: javax.xml.transform.TransformerException: org.xml.sax.SAXParseException; lineNumber: 18; columnNumber: 3; The element type "img" must be terminated by the matching end-tag "</img>". Caused by: org.xml.sax.SAXParseException; lineNumber: 18; columnNumber: 3; The element type "img" must be terminated by the matching end-tag "</img>". You are trying to create a table in pdf using xml right ? When I tried with the sample code and data shared here, I am able to get the output which is mentioned in the post. you can try this free online pdf to text converter(http://www.online-code.net/pdf-to-word.html) to convert pdf to txt file online.